Unlike most tremolos out there, TransTrems and S-Trems use bearings to provide precise movement. You can't see the bearings because they are enclosed in the bridge housing. The only part you might see is the post, which fits attaches the sides to the pivot part of the bridge. Standard - [universal product code 623] - Also called open bearings. These have open sides so you can see the individual ball bearings. These are the cheapest and were used for most trems shipped from the factory. We generally don't recommend replacing with these. See below. Shielded - [universal product code 623 ZZ] - These type have small steel shield inserts (like washers) in the sides that protect the bearings. Some later trems shipped from the factory with these. Although they would appear to provide greater protection from dirt and grime, we've discovered these are actually worse than the open type. They have a tendency to trap the contaminates more and wear out quicker. Sealed - [universal product code 623 2RS] - Instead of steel shields these have snug fitting rubber gaskets that protect the sides of the bearings, preventing dirt or moisture from getting in. These are the bearings you see pictured above. Because they are indeed "sealed" they also are pre-packed with lubricant, and don't require any maintenance or lubricating. When replacing bearings, we always recommend buying double sealed (623 2RS) regardless of what type are originally installed in your trem. Some distributors also offer bearings with only one side shielded (623 Z) or one side sealed (623 RS). We don't recommend these and only mention it as a reference so you're not confused if you run across them. Be sure you confirm you're getting the "double sealed" variety when you order. We've located a distributor who not only sells these bearings at a competitive price, but will also forego the usual minimum order numbers. The company name is Johnson Bearings. Price per pair is reasonable. However, they do charge minimum for UPS Ground shipping so you'll want to order yourself several pair to make it worth your while. They accept MasterCard, Visa, Discover and AmEx. For a little over $20 you can get 3-4 pairs of bearings delivered to your door. A pretty good deal. NOTE - The same bearings are used for the guitar TransTrem, guitar S-Trem, and the bass TransTrem. The bearing pins that get inserted into the bearing hole are technically "dowel pins" and are carried by many industrial suppliers in pre-cut lengths. These dowel pins can be made of many materials. In discussing it with Ned either the hardened steel or stainless steel would both work fine. Though the stainless is a slightly "softer" metal it's by no means soft (like brass). The original pins appear to be stainless and the stresses on this part don't warrant much concern about the material used. However if you're a vigorous trem user the hardened ones might be more to your liking. The hardened steel pin is on the left; stainless, the right. You might notice that these pins are slightly different lengths. First off this pic isn't to scale - remember these pins are only about 10mm (roughly 3/8") long. 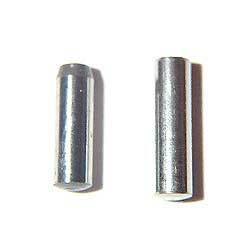 The hardened steel one on the left measures about 9.9mm; the one on the right closer to 11mm. Both of these are well within the specs for our purposes. Keep in mind there is a hole on the outside of the bridge that can allow for any excess length. The goal is really to have as long a pin as possible without it hanging out of the side. Both of these will accomplish this task. Note that the hardened steel pin has a pronounced bevel on the end. Even the stainless pin seems to have a very slight bevel on the top as well, though not as distinct. This feature would make inserting the pin into the bearing much easier. I'd add these length and bevel differences were specific to the ones we ordered. Dowel pins ordered from another supplier (or the same supplier at a later date) may be different from these. As long as you go with a 3mm x 10mm one you'll be fine. Click here for our new directions for bearing & pin removal & replacement. NOTE - As with the bearings, the same pins are used for the guitar TransTrem, guitar S-Trem, and the bass TransTrem.